Combining the added security of a deadbolt and the easy egress of a lever handle or knob, interconnected locks have a broad range of uses for commercial and residential buildings. An interconnected lock is basically a knob/lever set and a deadbolt connected together. 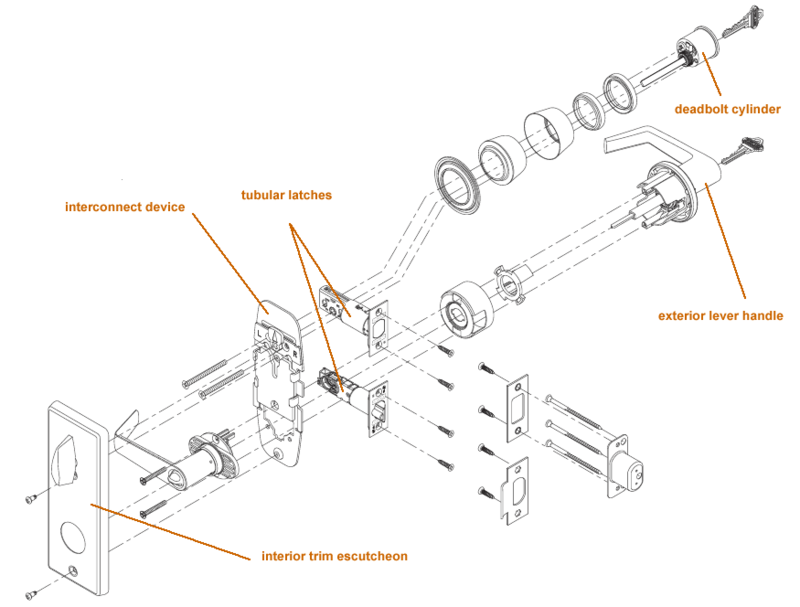 Interconnected locks are available for several door preparation types and in many styles. Many people prefer the interconnected mechanism for their residence because they're very secure and easy to use. Municipalities often require the use of interconnected locks for apartment buildings, assisted living centers, and hotels/motels, because of the single action egress the interconnect provides. In this article we'll discuss the various types of interconnected locks and their uses. How it Works. An interconnected lock is a knob or lever handle and a deadbolt linked together for simultaneous action. There are two types of interconnected lock mechanisms - standard tubular locks with interconnect, and mortise locks. Standard tubular locks are what most people will find on their doors at home. This type of lock is shown with the interconnect mechanism in the exploded view below. The interconnect device ties the lever together with the deadbolt. Both, the lever and the deadbolt, can be locked. With one single turn of the lever from the inside the lever handle and deadbolt are both unlocked - this is why the interconnected lock is often required for apartment buildings - one quick turn of the lever unlocks both locks for a quick egress. From the outside the lever and deadbolt must both be unlocked with a key. 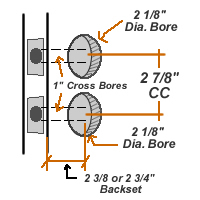 Door Preparation for Interconnected Locks. 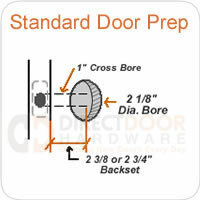 The door preparation is the size and location of the holes drilled in the door for lock installation. There are a few common door preparations, and some interconnected locks are designed to work with each. 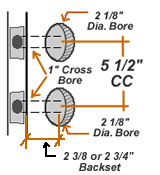 If you are buying an interconnected lock to fit a door that has already been drilled, it is critical that you check the size and spacing of the holes to make sure the lock will fit your door. 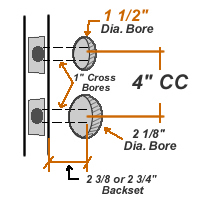 All the tubular locks require two 2-1/8" face bore holes and two 1" cross bore holes as shown below. The center to center measurement needs to be 5-1/2", 4", or 2-7/8". 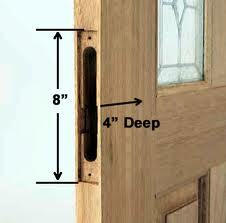 The most common door prep for residential doors is 5-1/2". The 2-7/8" center to center measurement is a less common residential and light commercial application. 4" center to center is a commercial door prep frequently used in apartment buildings and assisted living centers. Interconnected Mortise Locks. Mortise locks also function in the same way as the interconnected tubular locks we discussed previously. 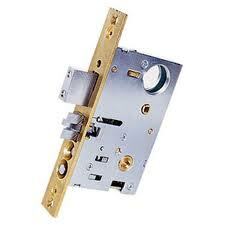 Mortise locks have a large lock box mechanism mortised into the edge of the door. This lock type is easy to recognize with its tall, one-piece faceplate on the door edge. Normally about 8" x 1-1/8". A keyed mortise lock is much like a regular lever or knob and a deadbolt combined into one unit. Mortise locks are strong, long lasting locks, and are typically more expensive than the tubular locks. In the Images below you can see the door preparation required for a mortise lock and an example of a mortise-style lock. These locks are available in many styles.